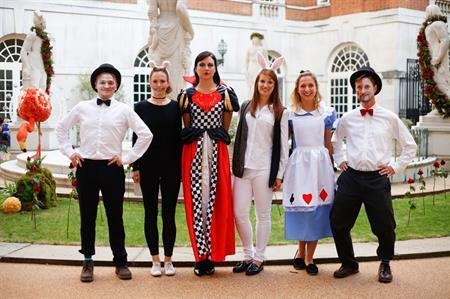 Almost 300 clients, event bookers and PAs gathered at BMA House on Monday (3 July) for its immersive summer showcase extravaganza, BMA Wonderland. In house caterer Ampersand wowed guests with innovative themed dishes and drinks. The afternoon tea station was a hit, with the toadstool cupcakes and pocket watch macaroons being definite favourites. Guests were further entertained by an expert illustrator accompanied by the sounds of in house band Buffalo Tale as they tasted refreshing iced coffees by Bewley’s. Wise Productions, a creative technical production company, celebrated 25 years in business with a special celebration at Porchester Hall, London on Wednesday (5 July). The evening brought together clients, partner venues, fellow industry suppliers, and friends of the company for an evening of fun, food and entertainment. The sound was provided by Wise Productions to create a laid back club atmosphere where guests were treated to hand mixed peach Bellinis, champagne and soft drinks. Canapes and light bites featured fresh summer ingredients and a focal point was the pudding station where guests were encouraged to load up and build their own Eton Mess. The guest list was drawn from across the industry including senior representatives from Timebased Events, Goldborne Events, Private Drama and Creventive. Event partners such as prestigious florist Simon Lycett and many of London’s unique and historic venues also attended to celebrate the 25th anniversary.